Last time I read it I gave up around half-way. I really like the beginning but it drags for me in the second half. The same goes for one or two others, yet I can read Excession over and over again. Mind you I think the worst for that is Matter - the first page or two kicked off a book which was nowhere near as good is it felt it was going to be, took forever to get going and then was all over in a woosh which left me largely none the wiser. I seem to have been in the minority in liking Matter. But there you go! 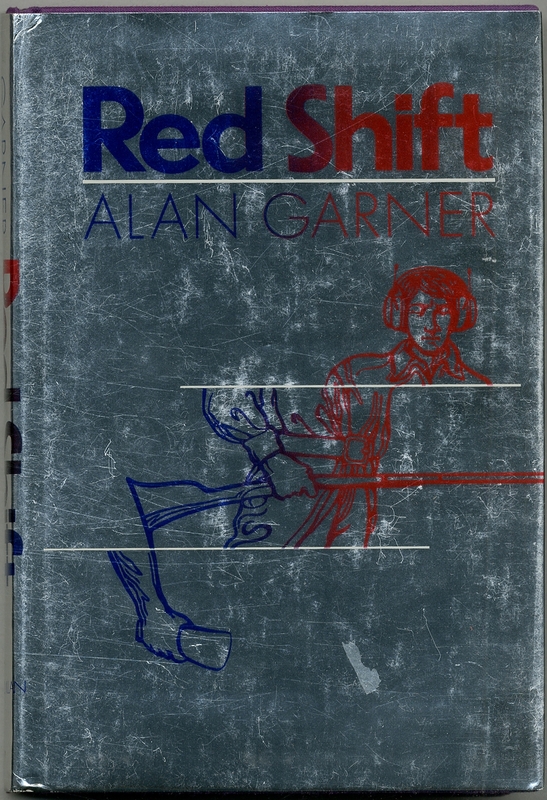 Giving Alan Garner's Red Shift a second reading now, after having first read it 39 years ago. Garner certainly may write a difficult novel if that's what he needs to do in order to reach for the artistic accomplishment he desires. But the reader may be forgiven for wondering if some of the difficulty isn't gratuitous. Suppose you have a group of tough characters with names like Face, Macey, Magoo, and Logan. One of them can go into a berserker fit by staring at a whirling object (some bit of horse gear). He comes out of his "possessed" state and finds he's killed eleven men. Now, we're supposed to take these as soldiers of the Ninth Roman Legion?? The novel is almost entirely dialogue and every so often one must check back to make sure one knows who's supposed to be speaking. But that may be a justifiable artistic move. I'm reminded a bit of Kipling in some of his later and more difficult stories. Mr. Garner, meet Mrs. Bathurst. ...This is interesting. I looked at some papers I'd filed, & saw that there's more than one text of this novel, and that the one I have (a British paperback) isn't the one Garner favors. I think I will try to get hold of the most recent one, which has an intro by him -- the one from New York Review Books -- and read that after I finish this text. I think a writer has the moral right to make a book every bit as difficult as it ought to be, given theme, content, etc., but, that understood, has also the moral obligation to make a book understandable by a reasonably intelligent reader. I have my doubts regarding whether, in the text I'm reading, Garner didn't make the writing wilfully difficult beyond what it should have been, perhaps for extraneous reasons such as showing the world he's not a children's book author or whatever. I'm not accusing him of that, just suggesting it is a possible explanation. He's bound to have been influenced by things he'd read and seen, but we might now ask if those were always influences for the good. I suppose he was writing the book in the late 1960s and early 1970s -- and how much of the "experimental" writing, cinema, music etc from then really stands the test of time? My hunch is that a lot of the "New Wave SF" seems pretty dated now... Perhaps this book of Garner's shows its period a leetle more than it was intended to. ? Now I've finished that second reading of Red Shift. I'm wondering if there's an element in the reader's experience of that familiar thing in which we tend to value more highly what we have worked relatively hard to attain. We finish reading this book, but it may be asked, what indeed have we read? There are three narratives. Are they really meaningfully related? The axe-head that appears in all three -- is this a lot more than basically a "cool idea"? To what degree is the most accessible narrative, that of the teenaged lovers, real and fresh? Are the two "historical" narratives fully alive, or is one or both somewhat dutiful -- as needing to be there for the sake of a pattern of recurrence-with-difference, but not much more? And are we persuaded by the recurrence-with-difference idea as may be unpacked here? I'm not sure. On 25 August 1973, I spotted and bought a trashy-looking paperback of a book I'd already read in a library copy and remembered fondly, Lester del Rey's Day of the Giants. I've never read this copy, although, when I was a high school teacher, around 1979, it was one of the personal copies of a fantasy book that I allowed students to borrow, and someone did. Anyway, I have begun to read it, and am enjoying it. I wonder if Airmont didn't go out of business not long after publishing this reprint. I vaguely remember covers like the ones shown in the link off the article, but darned if I can recall why. Maybe they catered to the grade school trade. Rex Gordon's "No Man Friday"
I probably read this in late 1962 or early 1963, and did not read it again until yesterday. I did not remember it as that good, but recently I got curious and posted details that I remembered in the Book Search threads (thanks @Extollager for identifying it). I'm fairly sure of the rough date because I think it was fairly soon after Jack Vance's "Dragon Masters" was serialised in Galaxy from August 1962 and I was gripped by its illustrations of dinosaur-like beings. Although I was familiar with the story of Robinson Crusoe, I think that, for me, dinosaurs were the main attraction of this book, which I took out of the library myself, as I'm certain the version I read had a black and white illustration of a small human overshadowed by a large dinosaur-like being that looked like the intelligent alien species in the book. Sadly I have not been able to trace this illustration, although I think the version I read had the cover above. I can't recall ever re-reading another book after such a long gap, and it's interesting for me what I actually remember. This mainly concerned my interest in dinosaurs. The book came out in 1956. The first half details how the rocket came to be launched @1958 from the British research station in Woomera, Australia, and how there was an accident in space leaving just the one survivor who crash lands on Mars. The book is his first person account of his experiences. He survives the crash-landing and ingeniously works out ways of accessing oxygen and water supplies. I remember nothing of all that or of his speculative self-comparisons with Robinson Crusoe. The bits I do remember involve his use of a tricycle (self-constructed) to get about on the barren plains, and his encounters with, first a peaceful herd of herbivores, then with the intelligent hundred foot long alien predators (compared to tyrannosaurus rex in the text) who communicate by flashing lights. I remembered that he was adopted by a young alien as a pet, and they learn to understand each other with a morse code language. I did not remember how he came to be "rescued" by an American expedition fifteen years after his landing. What the book does well (and I didn't remember this at all) was compare human motivation with the very different perspective of the aliens, and the human inability to comprehend this. The aliens clearly have a superior grasp of time and space in a way that humans cannot remotely understand. Despite being hundred foot dinosaur-like predators living without any slight sign of civilisation, they are way beyond human technological understanding, and easily dismiss the American expedition without harming them (though they could easily have done so). "If you were to stop doing, your life would be as all eternity. Why do you strive? What do you strive towards?" Then for you, way back in your reading life might be 15+ years ago, while for me it'd be more like 30+. If you were 20 now, reading from before you turned, say, 15 could be "way back." Thanks for your review, Hugh! That's just the sort of posting this thread is intended to elicit. I'm reading now, for the second time, Lin Carter's Tolkien: A Look Behind The Lord of the Rings, which I read, I suppose, once before, in 1969, when it had just come out.